March 4, 2000. 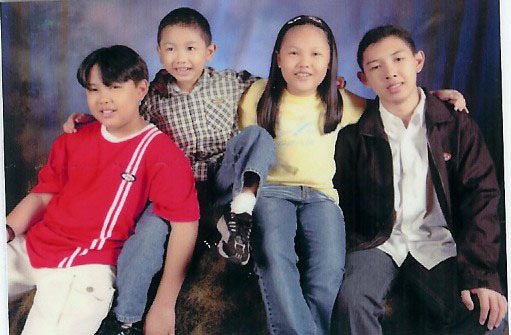 Rolly and Labeng's children are Robert, 10 years old, and grade four student of Saint Benedict College; Rollyboy, 6 years old, kindergarten student of Saint Benedict College; Madelaine 4 years old, nursery pupil of International Children's House; and the youngest is Neal, who celebrated his first birthday last February 24, 2000. 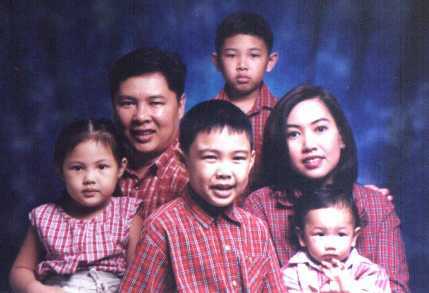 The family of Roland B. Beltran, of Malaybalay, Bukidnon, and Ma. Victoria M. Reyes, of Parañaque, Metro Manila, Philippines. Rolex is the founding partner of Beltran & Reyes-Beltran Law Offices, while Labeng is the Assistant Vice-President for Corporate Legal of JG Summit Holdings, Inc.
On the next page you will find more pictures of the family spending their New Year of 2005 at New World Hotel and the traditional summer vacation at Subic Bay Philippines. September 5, 2004. The Children are grown up. Robert is now in 4th year High School, Rollyboy is in Grade 5, Madie at Grade 4 and Neal a Prep Student, all at San Beda College Alabang. Page created on March 9, 2000. Last updated July 21, 2005.